Only showing entries about friendly from Sustainable Travel. View entries about friendly from all Travellerspoint blogs. Connor and I have been hitchhiking quite a bit while we’ve been doing our around the world tour. We just stand somewhere safe, have a sign, plenty of room for the person to pull over, not too much of a speed limit, a friendly helpful population and voila!!! You got yourselves the most interesting way, sometimes most efficient as well, to travel around and connect with the country of your choice. I wouldn’t recommend it in all places, but I’ve personally done it in Hawaii, Australia (including Tasmania) and NZ and encountered nothing but friendly folks wanting a chat or wanting to help us out. But how about all those murders on the news involving hitchhikers? Well, think about it… usually it is the hitchhiker that is at risk, by getting into a car they don’t know, not the driver. Another thing to think about; tragedies involving hitchhikers will always reach the news because of its adventurous nature, it is news worthy. There are people disappearing, getting shot at, dying in accidents, getting raped or murdered every second of the day somewhere in the world, but those don’t always make it into the papers, do they??? I’d say you are perfectly safe hitchhiking if you are being smart about it. Just as you’re safe crossing the street using the crosswalk and the green light. Never had one dodgy person wanting to give us a ride. We are a couple though and Connor’s quite tall, but we look like legit decent travelers. We try not to look too scruffy or dirty and also to not smell too much. Which is pretty much impossible after coming out from tramping in the bush for multiple days, people must have thought we smelled pretty bad sometimes. I guess we could have bought a car and have spent half of our hard earned money on petrol getting around, but let’s be real. Our way of traveling would have put that car 75 percent of the time parked and forgotten somewhere in the middle of nowhere. Plus getting a ride with locals just gives you so much more valuable info and sometimes free food, alcohol and a place to stay even. What more could you want? 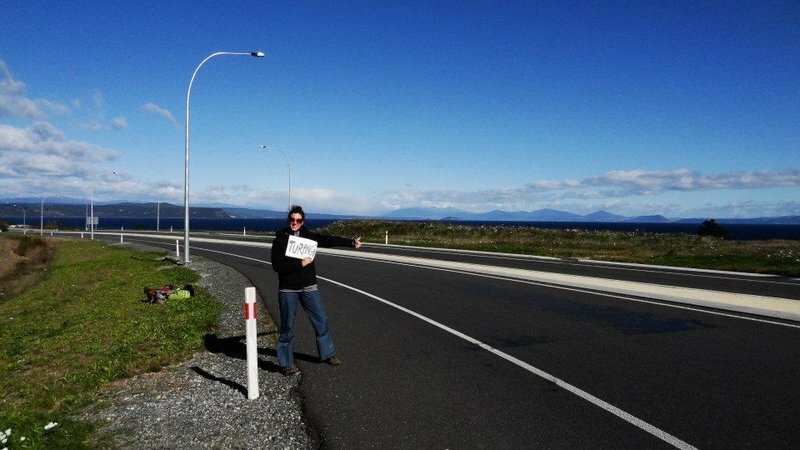 Hitchhiking has proven extremely useful to us and sometimes was better than your average expensive taxi or shuttle service. As there are sometimes no busses at all to be spoken of in certain remote regions, it’s your only choice of transport anyways. I got used to it and still think it was the best way to travel around certain countries like New Zealand for example, where we were for the last 6.5 months. Now we are in Fiji and the rules are different here. You can hitch with any vehicle but you are expected to pay the amount it would have cost for you to take the bus. As people are poor and busses are not many (in remote areas) and everybody who does have a vehicle is trying to make an extra buck or two. So the genuine hitchhiking is non-existent here, but that’s not throwing us off. We’re enjoying taking extremely bumpy and overly long bus rides. We’ll see how things will go when we get to our next destinations, but as soon as we have found a country where hitchhiking is done I’m jumping back on board! !